Before entering into an agreement with an agent or distributor overseas, you need to do some research on the law in the territory where he or she is based. In some countries, for example, there are rules that require agency agreements to be registered with a Government department or that stipulate only nationals of the country can become an agent of a foreign supplier. Who is entitled to act as an Agent? – is this confined to a national or company owned by nationals of the State or can a foreigner act as your agent? What are the basic legal rights of the Agent and the Principal? What are the rules concerning termination of the Agency? Are there any registration procedures? Does the law distinguish between agents and distributors? In Europe, the rules only apply to agents but in some countries of the Middle East, the distinction is blurred and a distributor might have the same termination rights as an agent. You might think that the issues mentioned above can be avoided if you say English law will govern the agreement with your agent. Unfortunately, it is not so simple and the local courts or even the legislation may take a different view. Be sure to spell out all the key requirements in your agreement – territory, products, commission, initial period, targets, termination rights and much more. Don’t ever omit any important matters in the hope they will sort themselves out later. 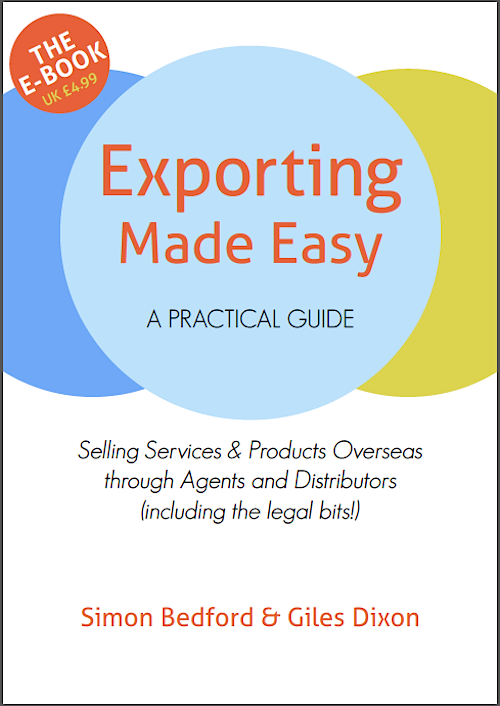 Thank you for producing a plain English and practical guide in 'Exporting Made Easy'. I'm currently in the start-up phase of my business as a Commercial Agent and have found your book really useful. I attended Simon’s workshop for UKT&I on Agents & Distributors and his professional, friendly advice on exporting and finding the right agents and distributors was excellent. Inspired to purchase his book and in particular the legal bits which will save hundreds of pounds in custom-written contracts. We need only to adapt and then have a legal international lawyer check it over. Thank you Simon. Linda Adams, director, Repeat Software Ltd. The Exporting Made Easy E-Book at £4.99 - download to your device straight away. Click to follow this blog and learn more tips and info on exporting.